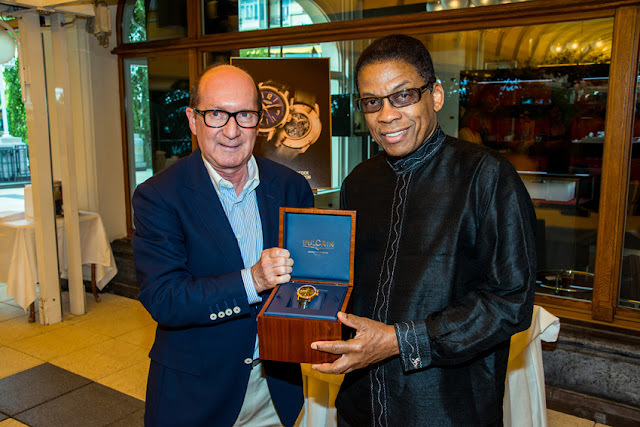 Just moments before his his 32nd concert at the Montreux Jazz festival, in front of an appreciative audience, Herbie Hancock was greeted by the CEO of the Vulcain Manufacture, Mr. Bernard Fleury, and was presented with a watch specially dedicated to him: ‘The Vulcain for Herbie Hancock 50s Presidents’ Limited Edition in Pink Gold’ bearing the number 1/50. Born in Chicago in 1940, Herbie Hancock was 11 years old when he first appeared on-stage, performing Mozart’s concerto no. 5 on the piano and accompanied by the Chicago Symphony Orchestra. The American pianist, keyboardist, bandleader and composer helped to redefine the role of the jazz rhythm section and was one of the primary architects of the ‘post-bop’ sound. He was also one of the first jazz musicians to embrace music synthesisers and funk music. Hancock's music is often melodic and accessible; he has had many songs "crossover" and achieved success among pop audiences. His music embraces elements of funk and soul while adopting freer stylistic elements from jazz. In his jazz improvisation, he possesses a unique creative blend of jazz, blues, and modern classical music. Herbie Hancock graduated from university with two degrees: one in music and another in electrical engineering. Eager to explore new avenues, Herbie Hancock subsequently founded his own group, the Headhunters. Their first eponymous album became the first platinum record in the history of jazz, and the “Chameleon” hit was an instant legend. Herbie’s projects have had a profound influence on jazz and on American music in general. He is considered one of the prime promoters of funk, an instigator of rap, as well as a source of inspiration for R&B artists. He even released the Future2Future album in 2001, merging technology and music. By associating computers with turntables and legendary voices, he laid a new milestone in the quest for contemporary sounds. Alongside his professional commitments, Herbie Hancock also supports several charitable causes pursuing a social, musical or medical mission. On July 22 2011, at a ceremony in Paris, Herbie Hancock was named UNESCO Goodwill Ambassador for the promotion of intercultural dialogue. 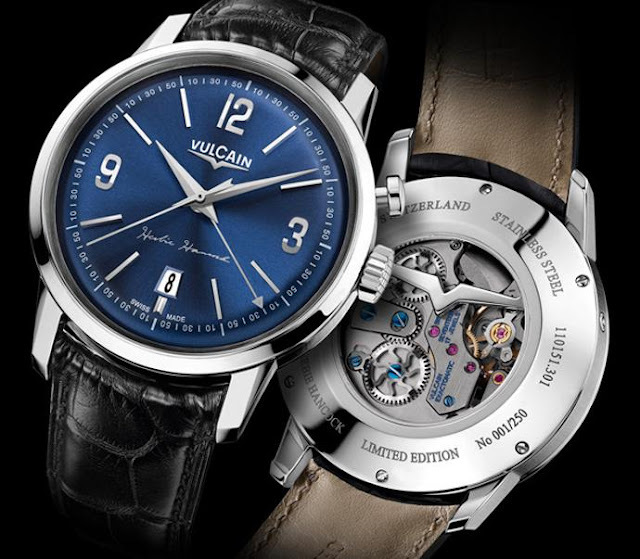 Watch manufacturer Vulcain has established a partnership with pianist Herbie Hancock resulting in the creation of two limited-edition 50s Presidents’ Watch models dedicated to the pianist. The watches feature midnight-coloured dials with what is described as a sunburst dial in an entirely original intense shade of blue. The watches are powered by the famous hand-wound Cricket V-16 movement with a 42-hour power reserve, and the timepiece displays the hour, minute, second and date, as well as the alarm. The case measures 42mm in diameter. The back is engraved with the name Herbie Hancock. 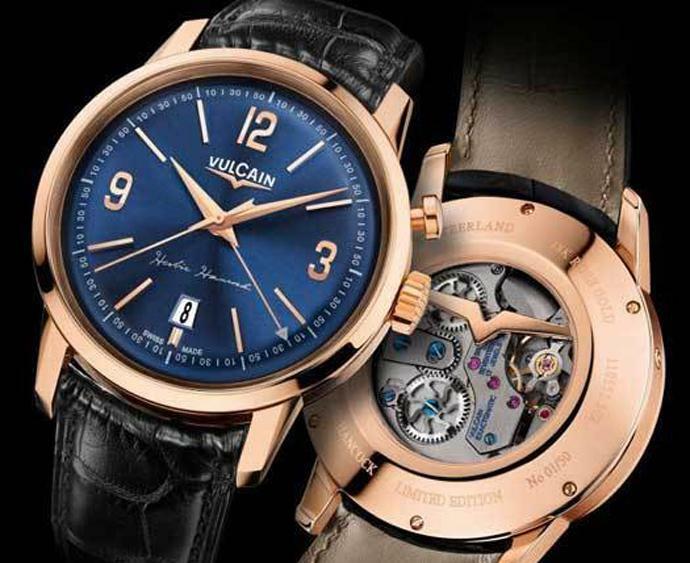 The “Herbie Hancock” 50s Presidents’ Watch is available in two limited editions: one in 18K pink gold issued in a series of 50; and another in steel in a 250-piece limited series. 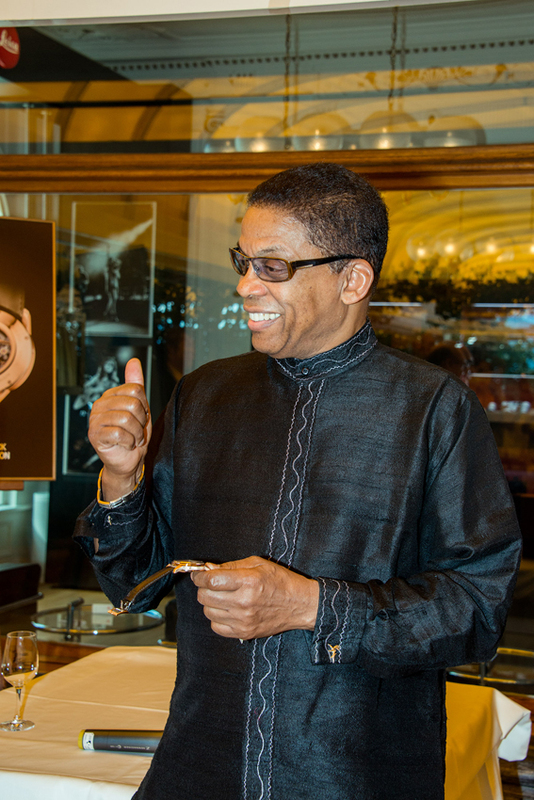 Each of the watches in the Herbie Hancock special edition is accompanied by a certificate bearing his signature and authenticating the limited-edition production of each of the models, along with an album by the art. engraved with the name of the celebrated musician. Strap: Louisiana Alligator – Dimensions: 22/18 mm. Buckle: 18K 5N pink gold pin buckle. Calibre: Vulcain V-16: 12-lignes mechanical hand-wound alarm ca-libre with date, 17 rubies, 191 parts, double barrel, equipped with the Exactomatic system, lift angle 48°. Frequency: 18’000 vibrations per hour.